Home of the Stimmung Stunde! This is the home of the German radio show running from 1990 to 2007 in Milwaukee, WI. Though the radio show is no longer on the air, we continue to maintain this site for its past outstanding achievements! If you love Palacsinta, this is the event for you. What are Palacsinta? 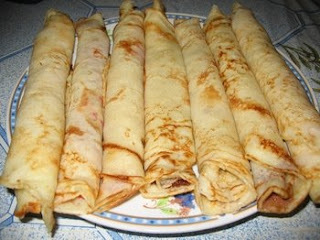 They are the Croatian version of a crepe and they are delicious. Palacsinta is filled with either jam or cheese and there are other breakfast items available such as pork links and beverages. Here'a a sample of what you get. Get ready to celebrate with the Spielmannszug Milwaukee's Mardi Gras by dressing up in your favorite costume. There will be fabulous prizes for the best costume and you will have a lot more fun when you dress up in a costume. Johnny Hoffmann & the Herzbuben will be playing for your dancing pleasure. This annual event held by the Danube Cultural Society (DCS) is fun for the whole family. In the past there was always food available for purchase but this year this popular dance includes a delicious Rouladen dinner. 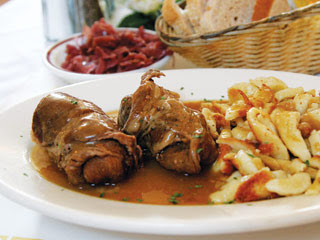 The Dinner will be served at 6 p.m. featuring Rouladen, Spaetzle, Red Cabbage Vegetables and Dessert. Don't miss this special treat. As ususal the DCS dancers will perform after dinner. But the real fun starts when the auctioning of the Kirchweih strauss begins. Be part of the action and place a bid on the Kirchweih strauss. The big surprise comes at the end of the evening when the new "couple" is announced. Also, you can visit this group on facebook. Advance tickets available at: Ray's Liquor (8930 W North Ave) & Weissgerber's Old German Beer Hall (1009 N. Old World Third St). The Spielmannszug Milwaukee is proud to present their annual Bock Beer Fest. 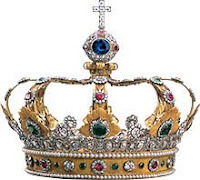 There are beer drinking contests and a king & queen are crowned at the end of the night. But there is plenty of fun in between those contests. Take a look at the slide show below with pictures of past Bock Beer fests. There were even some surprise guests from the Klements Racing Sausages. Rumor has it that they will be appearing again this year, so be sure to bring your cameras or at least the cell phones that have a camera built in. There will be food available for purchase. Usually some delicious sausages (like brats & knackwurst) and a lot of homemade desserts. Of course, there will be no lack of liquid refreshment that night. After all you cannot have a beer drinking contest and not have beer, right? 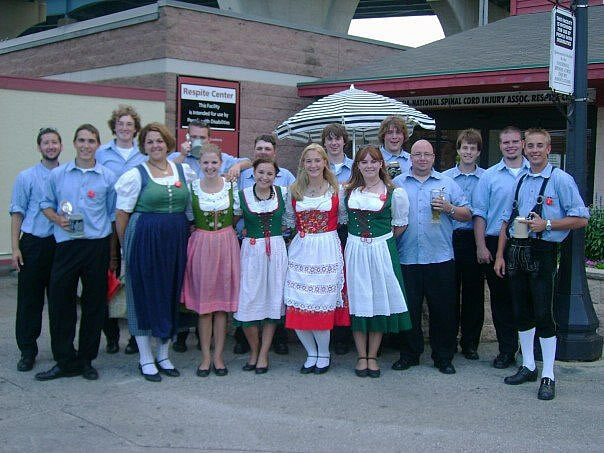 The Blaskapelle Milwaukee is going to celebrae Spring with their annual Fruhlingsfest. Come on out and support this new young band here in Milwaukee. They are planning a great evening that includes dinner catered by Rupena's Fine Foods and live music featuring the Blaskapelle Milwaukee and Peggy Mueller & Friends with traditional German music. 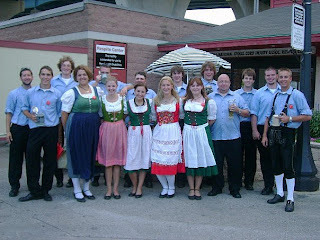 N89 W17534 St. Thomas Dr.
Last night the Rheinischer Verein, here in Milwaukee, held their season's crowning event. The new Princinpaar are Hansi & Peggy Mueller. Peggy is a well known musician here and an expert at playing the button box and Hansi accompanies here on the "spoons". We had great fun making wise cracks to poor Hansi about why doesn't your scepter have a spoon on top! They certainly looked like royalty last night and gave the evening a special flare. Their nephew, Andy Hacker, came with his full 18 piece Blaskapelle, the Blaskapelle Milwaukee, and provided some real authentic Blasmusik. They had a special guest, Ernie Broeniman, who is the director of the Dorfkapelle. He joined the Blaskapelle and played right along with them like just another musician. the youngins decided to do some Schunkeling like they do in Johnsonville. 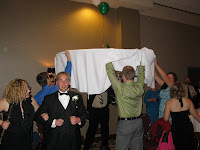 Take a look at the picture to the right; they lifted the table up above their heads, Wow! 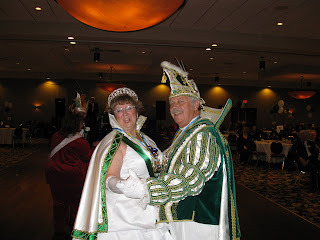 I will be a wonderful carnival season with these two fun loving people as the royal couple. Be sure to watch/listen for this year's events. They are sure to have a few surprises. Katie Buchert, a well known member of the Milwaukee German-American community, found peace on Friday, October 22. She battled cancer for four years and fought this dreaded disease with all her strength. Several times they thought that she had overcome the cancer and started to live a normal life, just to be struck down again. Only her family really knows what Katie went through in those four years. She had many friends, but Mom & Dad were always at her side, whether taking care of her needs or encouraging her to have hope. Her sister, Jenny, and her young family offered support whenever Katie needed them. These two sisters were very close and even vacationed together. Many in the Milwaukee German-American community only remember Katie as a young girl. She went off to college and many never saw her again because of the private war she was waging against Cancer. What is saddest is that this lovely 26 year old girl never got to be the young lady she was destined to become and grew up far too quickly and far too difficult a path for any to follow. Katie was part of the Danube Cultural Society and did ethnic dancing for most of her short life. The club became an extended family and also provided support during the difficult times. But most of all, they offered fun for Katie and helped her get through things with a smile on her face. Katie's mom, Mary, is the director of the dance group and was always there for Katie. Mary never gave up hope and was active in several Breast Cancer fund raisers. Katie's Dad, Hans, was very supportive of his beautiful young daughter's plight and particiated in fundraisers for Breast Cancer Awareness at Boxhorn Gun Club each year with his fellow team mates, the DCShooters! For more information please click here to go to JS Online announcement. For those planning to attend the funeral or burial, the family asks that you wear something pink to denote her confrontation with Breast Cancer. and I will try to include them. Katie has been an inspiration for many local people to renew the battle with Breast Cancer. She passed away on Breast Cancer Day is ironic, but it has also encouraged many to fight this horrible disease in their own way. Well, it is that time of year where the nominees for the annual Grand Prix der Volksmusik competition finalists has been determined. As many of you know, each country (Austria, Germany, Sudtirol & Switzerland) will have 4 representatives from each country that were determined in each country's competition. Then they send those top 4 to the final competion being held in Vienna next week on August 28, 2010. (interview with Stimmung Stunde 2007). Those of you who get the DISH German shows may have seen that competition in Sud Tirol. I did not get a chance to see the Grand Prix vorentscheid for Germany because we were in Germany at the time, but I am very disappointed that Feller & Feller (interview with Stimmung Stunde 2005) did not make the finals. 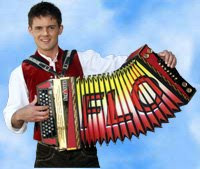 Hansi Feller is a very talented singer/song writer and one of my favorites. about her new plans to be a solo act. Here is a list of artists and their songs that will be in the finals on August 28 in Vienna. They are in the order they came in at their own country's competition and in some cases I have links to their webpages. Please click on the Comments at the bottom of this posting and let us know who you predict to be the winner this year. I am going to take Photos at German Fest each day, so watch this post as I keep adding photo albums to this space. This was the day before German Fest started. A mini-concert was scheduled on Old World 3rd Street with all the German Entertainers. This was one wet day. It rained all day, but toward evening it REALLY got bad! First they shut down all the audio equipment. Then when it was reported that the weather was getting worse, they shut down everything. Our ride home from the fest grounds was a bit scary. There was a lot of flooding throughout the Milwaukee area and fear is that it will continue till tomorrow. All the pictures are mostly of the rain. I think the Butzenmaenner actually played for a little while, but the 30th Anniversary showcase never got started. Let's all hope that the weather will soon get better. The sun was shinning all day. I have several pictures of the Blaskappelle Milwaukee in this bunch of pictures and the German singers showcase. I am short on time, but I wanted to get Saturday's pictures posted before I go down to the fest grounds. I will be updating these pictures next week. Last day of German Fest. I have to get up on Monday at 4:30 am to start work at 6 am, but I wanted to get these pictures out for everyone. During the week I will return to the website to add captions. But in the meantime here are the pictures. Please remember you can just click on the slide show and it will take you directly into the album on Picasa. Then find the photo you want to download -- right click on the photo and download it to your computer. It's all FREE. Love that Picasa. I have not posted much about German Fest this year. I did not feel the need, because they have finally started using their website and posting much more information than they ever have in the past. If you are looking for deals or specials on some of the days, please be sure to go the the German Fest website. However, I did not want disappoint some of my readers and give you a little more info about the info this year. Also, I like to provide links to the artists' webpages, so if you would like more info on some of them it is available. (German Fest website does not provide them). I am not going to list the local acts this year, because it would just take too much space. Claudia & Alexx - Those of you who attended the Christmas show in Milwaukee (or in Chicago) will notice that Claudia has a NEW Alexx. I am providing a picture taken by my friend, Maria Olligies, who sent this to me in April. Most of the previous advertising from German Fest did not provide this info, but I am happy to see that they updated their website recently. Also, here is a link to YouTube where Claudia is doing a single, Lass uns Fliegen. Personally I think she does not need to be a Duo. Her voice is very strong and can stand alone, but I guess everyone needs a gimmick. Click Here for Claudia's facebook page. Francy B - This is a new name to me. I have not seen her on German TV, asked my friend in Germany about her and she is unfamiliar to her also. Not sure what kind of music she does, so it should be interesting. Geschwister David - Recently the Geschwister David have been on Stefan Mross's Immer Wieder Sonntag's TV show, where they competed with their new song, Ach wär doch immerzu nur Sommer. It should be a treat to see these two talented girls. 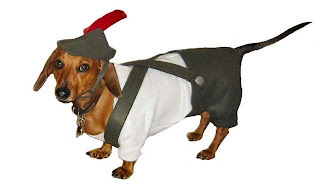 They usually seem to wear dirndls but I don't know if they yodel. Golden Sixties Band - Again, this is band I am unfamiliar with. Robert Deglau has been advertising on his Continental Showcase that, of course, they play the oldies. He has played some cuts on his radio show and they sound very good. Max Lechner - Max Lechner has appeared several times in the Chicago area, courtesy of Armin Homann, who is a DJ there. Max also brings other entertainers with him that he manages, such as Armin Stoeckl. Max was in Milwaukee for the Christmas show in 2008 and is happy to return to Milwaukee. Robert Deglau has invited Max to co-hosting the radio show, Continental Showcase, on Saturday, July 24, from the festival grounds. Armin Stoeckl - The first time I saw Armin Stoeckl was in 2007 at Lake Villa. He was in a show with Romy, who has been on many German TV shows. Armin has some very nice songs and Robert Deglau has been playing them faithfully every week on his radio show, Continental Showcase. Robert invited Armin Stoeckl to do a Christmas show in Milwaukee in 2008. 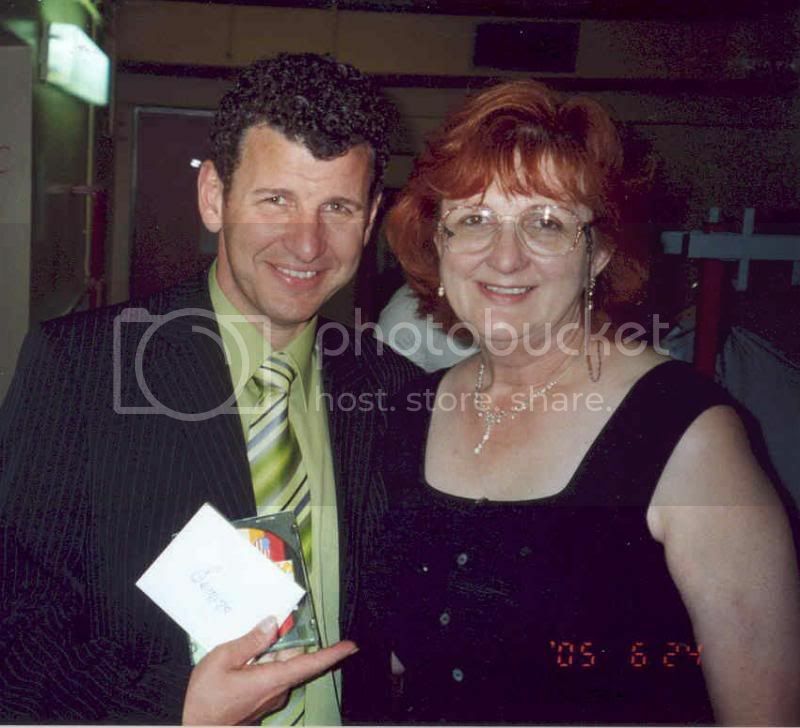 Max Lechner organized the Christmas tour and also had Birgit Pless in the show. This same show appeared in the Chicago area and there are many people in our area who have seen Armin Stoeckl in the past. Robert has been telling everyone to be sure and catch Armin's rendition of Elvis; he says it is a show stopper. Regina Thoss - I do not know this entertainer either, but I like her website. It is easy to move around in and she looks like she has been around a long time. I saw a picture of her with the late Ted Hierl† (whom she identifies as Fred Hierl) in 1993 when she was in New Jersey. So this is not the first time she has been to the US. Biba und Die Butzenmaenner - This is a group from Germany, but is not part of the showcase listed above. They were at German Fest about 2 years ago. They play a little more American style music and is there for the younger crowd. If you are over 50, don't expect to sing along with the songs they play. The picture to the left was taken when they were at German Fest last time. Elmar drove them around last time and found them polite and appreciative. Although the old like I had for these guys has been changed, when they arrived, I asked for the new web address. So just click on the link above & you will go straight to their website. On May 10, we visited Wartburg. This is where Martin Luther translated the Bible into the German language. It is a beautiful spot with a fantastic view. That evening we had quit a line-up of entertainment. It started with a glass blowing demonstration with Wiilly and Regina Knoth. They have been to Milwaukee's German Fest and Willy is also part of the Sandlers. Willy is also a single entertainer and did a show for us that night. Felix Reuter did classical music with a comedic flare and had us all laughing. He is quite a talented young pianist. Then it was Mandy Bach's turn. She is a charming, pretty young women and she really got the guys to sit up straight in their chairs. 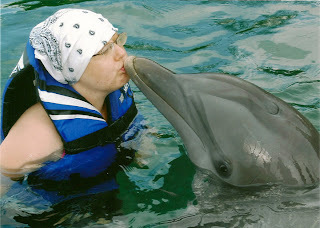 Our friend, Henry, really liked her and we proceeded to tease him about it the rest of the trip. She has some nice songs and you can find more info about Mandy Bach on her website. Here is a link to the pictures we took there. .
May 11, we toured the town of Weimar, the birthplace of Goethe and we toured the city of Erfurt. The statue of Goethe & Schiller was especially interesting to us because a replica stood in Milwaukee in Washington park for many years. It was a very busy day, but it ended on a high note when we went to dinner to the Christoffelhaus. The food was from that period as well and was delicious. The menu offered such things as: Sackpfeifenschmaus, Schrotfladen mit Schwarz bierfleisch and Grill Haxe in Schwarzbiersosse. The servers were dressed in medieval period costumes. There was a lot of audience participation and we had a lot of fun that night. Pictured on the left is Siegelinde, who together with Otto documented our trip for the newspaper, New Yorker Staats-Zeitung. I found their account of this trip priceless in bringing back memories, providing details and helping me sort through all my photos. To see the pictures from that day's activities... .
May 12, again Peter & Gisela had us busy from morning till evening. We visited a traditional factory of Erzgebirge Holzkunst. They had wonderful handmade wood figurines, Christmas ornaments and just a variety of wood carvings. I did some great shopping here. Then we went spent the rest of the day in the city of Dresden. I was very impressed with this city; it had been severely bombed during the war and I was amazed at how they rebuilt the Frauen Kirche. We came back to our hotel for dinner and Heidi (formerly Heidi & Heiko who appeared several times at the Milwaukee German Fest) was waiting for us. She entertained our group that evening and even one of our group, Wolfgang Ribbert, sang a few songs for us that evening. 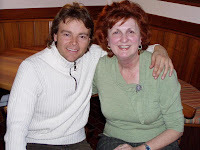 Wolfgang is a former opera singer and has organized many music shows with German singers in the Ohio area. Wolfgang documented our trip and has 2 DVD's available of our trip. for the pictures. May 14, we visited the Basilica Vierzehnheiligen. A resident monk greeted us and addressed our group for about 30 minutes explaining the history of this very impressive church. Then the men went in search of having an authentic Kloster Beer. Next was a stop at Hummel. We were greeted by the new president of Hummel, who is not longer part of Goebel. He is a Delaware native and addressed our group in English. He showed us a short film documenting the history of Hummel and then the best part... SHOPPING!!! The tour continued on to Peter's hometown, Steinach. We welcomed by the mayor of Steinach and the town choir sang a few songs for us. Then it was a short hike to the Waldhaus where Peter spent many hours playing his beloved button box for guests there. Peter's mother had made the potatoe salad for our group. Peter's band, the Sandlers, was in charge of cooking the authentic Thuringer sausages. It was an evening that was certainly full of stimmung and ended with entertainment by the Sandlers. for the photos of Steinach and to see the pictures of the Basilica & Hummel. May 15, we traveled to our 3rd (and last) hotel in Landau. We saw beautiful scenery on our way to the hotel as we drove through the Pfalz. We quickly freshened up and got ready for the big show in the evening of Anni and Moni's 20th anniversary. Because this was a very full program, I will do a separate posting of this day's activities. May 18, was the last day of our tour and I will do a separate posting for this day. I would like to thank Gisela Lewis and Peter Matthai for putting together such a fantastic bus tour. Every day was filled with many activities, sites and, of course, music. We know that there was a waiting list for this trip, but I heard that there is already a waiting list for next year's trip to the upper part of Italy (Sudtirol). However, if you are interest in next year's tour, please contact Gisela because she is contemplating having a 2nd tour if there is enough interest. Take a listen to the latest podcast, just click on the player below. To hear our show, click on one of the episodes below! I hope you find the information posted here helpful or even entertaining. Do you miss Radio Melodie as much as I do? Radio Heimatmelodie is a great Volksmusik/Schlager web-radio. When you click on the link, you will see a small player, just double click and you are connected. I really like the fact that they have a spot on their webpage that displays the name of the song & the artist that is on. Also, they play the Bavarian national anthem at "their" midnight. I love opening this link and just play it like a radio, while I continue working on my computer. Try it out and see if you like it. Also, it keeps you up-to-date on what is popular in Germany along with local news. If you would like to hear the Semino Rossi interviews that were broadcast on the Stimmung Stunde, please click on the audio player below. Click on the Happy Button Box. It will take you directly to the Milwaukee German Bands page or click the red Menu button labeled “Links” and you can see all the links we have there, including our link to the new page that lists popular German Bands in Milwaukee along with all their contact info. Get the Graphic Timer widget and many other great free widgets at Widgetbox! Help save your colorful beetle buddies from being enslaved by the Black Bug Empire. Click on the Logo above to sign up and get TV directly from Germany on your computer. See all the programs that Germany sees. Click the button on the left to go to YouTube and hear the hottest song in the nation. 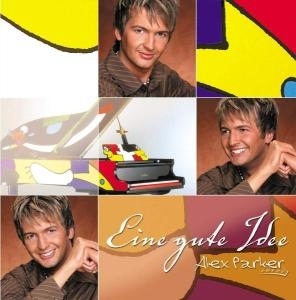 I am sure our German-American's will like this song. If you are located in the greater Milwaukee area and need a tree cut down or just trimmed out a bit, contact the Door to Door Tree Patrol. Luis Sanchez will be to help you with all your tree timming needs. He is fully insured. Version 1.0: Site launched on May 4, 1996. Major revision June 23, 1996. Major revision December 15, 1996. Site moved February 14, 1999. Version 2.0: Site relaunch on May 20, 2002. Regular maintenance: June 21, 2003. Version 3.0: Relaunch on July 4, 2003. Version 4.0: Post-program reshuffle April 18, 2007. Version 4.0.8: Last Maintenance: November 1, 2007.